We have hand picked the very best in ceramic cake stands, so you don't need to spend hours searching online - you can find the right stand here, instantly. 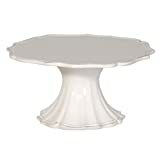 Our choice includes cake stands to suit all tastes and budgets and is selected only from reliable retailers in UK. And our Price Checker is updated constantly, so you can be sure to find the best deals and prices. Show off your baking creations in style with this pretty cake stand, decorated with Cath Kidston's lovely spray flowers print. Crafted from porcelain, the colourful Secret Garden range of tableware has been created exclusively for John Lewis by Portmeirion. 2 tier cake stand. This pretty cake stand is handpainted with a casual dotty print that exudes country cottage charm. will take a large cake or 12 cup cakes. On this page we have tried to include a variety of ceramic cake stands, that may include a range of materials, such as earthenware. In other words, all the pottery cake stands that don't come under the fancier headings of porcelain or bone china. But this doesn't mean that ceramic cake stands are an after thought. Not at all. In fact you can find some excellent cake stands in this material, which lends itself perfectly to making elegant crockery of all kinds. So we have included single, 2 and 3 tier cake stands, in contemporary and traditional styles, some with minimal design, others with a more ornate, traditional or country look to them. 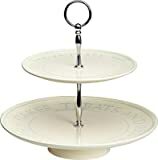 We love this three tier ceramic cake stand from Not on the High Street. It has a mix of old, country charm along with a grander, Regency style to it. We especially love the mismatch of cake plates - all three tiers are different, yet belong together. This cake stand has a gold coloured spindle, handle and stand. It stands at 35cm heigh, and the ceramic plates measure 15cm, 20cm and 24cm in diameter, from top plate to bottom plate. Picking out the right stand for your baked goods need not be complicated if you know what you are looking for. There are many to pick from for your special occasion or if you just want to place one on your kitchen table for everyone to see. 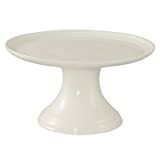 You can choose from different shapes, sizes and materials when buying a cake stand. Although round is the most popular, you can also choose square stands. Choosing the size depends on what you are serving and how many guests that you plan to invite to your event. You can find ceramic, glass, porcelain and acrylic stands. 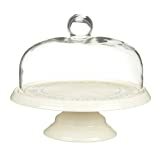 Cake stands come in a variety of styles and colours to pick from. You can pick a tier stand that comes in 2 or 3 tiers or just a cake plate. If you are serving ribbon cakes at a wedding or cupcakes at a party, there is definitely the right cake stand out there for you. Some set up on pedestals and some lay flat. You can pick from wedding, cupcake and vintage cake stands. For freshness, you can purchase domes or lids to cover your goodies. Here at Cake Stands, we search high and low across the internet to bring you the very best in cake stands, plates and cake tins. See the links below for all the different types and styles of cake stands, or see above for our choice of the best in ceramic cake stands.